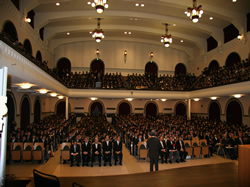 Entrance ceremonies for undergraduate and graduate students are held in early April in the historic Kanematsu Auditorium. 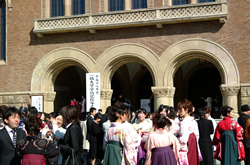 Welcome parties are held in April of each year for overseas exchange students who enter Hitotsubashi in April. This party is attended by the university president and vice-president, as well as faculty members, tutors, representatives of the Josuikai alumni association (which is a constant source of support for the university) and regional international exchange organizations. As forums where attendees can engage in easy social interaction with new exchange students, this party provides a good impetus for study at Hitotsubashi. The Kodaira Festival is a university-wide festival organized primarily by students of the freshman class every June. Nearly every element of the festival is planned and run by first-year students, including class-based refreshment booths, spectacular decorations, and many kind of programs. The Kodaira Festival is a big event at Hitosubashi that draws people from many regions. 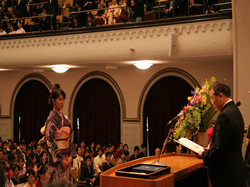 Held annually in late November, Ikkyosai (“Ikkyo” is an alternative reading of the kanji characters for Hitotsubashi, and “sai” is festival) is the university’s fall festival organized by the entire student body. Refreshment stands are operated by clubs and other student organizations. Staged events include bands and martial arts exhibitions, with academic symposiums also held. This is a fun event enjoyed not only by the students but also local residents of all ages. 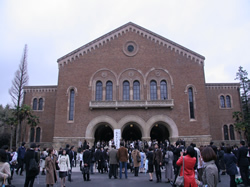 Undergraduate and graduate degrees are conferred in graduation ceremonies held in Kanematsu Auditorium in late March. The Master of Public Policy in the Asian Policy Program degree and the MBA in International Business Strategy degree are conferred in a ceremony held in summer at the Chiyoda Campus.